My daughter went on a week-long school trip today morning. She and 30 other kids will visit Switzerland, France and Germany. It is school trip in Europe by bus and that means leaving early to avoid the traffic. I brought her to school at 5:30 am (yes, 'am' means morning!) and since our office is close by and it takes me 30 minutes to drive home … I figured I could just as well go to work early and avoid the traffic jam later. 5:30 is an inhumanly early time and I might need to start drinking coffee again to stay awake till lunch time. On the positive side, I had some time to finish couple of past-due tasks. 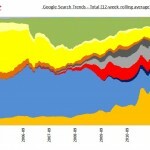 One of them is to update the Google Share of Search Report. This is based on Google Trends and we use it to have an idea what antivirus brands people are searching for. The good news for AVAST is that we are clearly the most searched-for security brand with a 36% share and growing. The attached chart shows that after the spike of interest in March 2011 following the launch of version 6.0, AVAST is now back to the high share level we had during the launch. Having the extra time on my hands this morning, I also looked at the country details. I find it interesting that there are a number of countries where Google users search only for AVAST and no other antivirus brand! For example in Latvia, Uruguay, Panama, Ghana, Dominican Republic, and my favorite (since the DreamWorks movie release) Madagascar. In all of those countries, AVAST has 100% search share! Thank you! I’m not sure what all of this means as I’m not fully awake. But I’m certain that tomorrow morning I will sleep late and I will also propose to my family that we take a summer holiday in the Dominican Republic. Sandy beaches and many AVAST users to talk to must be a good combination!